Online | Anti-Bullying Disability: Listen, Learn & Share! Many people like playing games. Playing a board game at home with friends or family is fun and safe. Playing online is a different matter – you need to think about how to keep safe. Hayley, a volunteer with AbPhab reports. Playing online games is fun but please make sure you are as safe as possible. Always use a nickname name when you go online. Never use your real name. A lot of people like playing online games that involve talking or chatting to people you don’t know. Be careful about what you say. Don’t tell them things like your real name, address, birthdate or other personal details. And never give out your password. Giving out personal information can put you in danger. If you’re playing a game online, and it has a chat room on it, be careful. People can lie about who they are and where they are. If you are talking to someone on a headset, be aware that they can record your voice. It is safest to talk online to those people who you actually know and see in your everyday life. Never send threatening messages to anyone. You can get into trouble with the police. If you have children, make sure you look into parental controls. These will help your children remain safe. If you are a child, talk to your parents or carers about controls. Take lots of breaks from online gaming. It’s good for your mind and your body to take a break from screens. Make sure you are having fun. Don’t let online gaming make you sad or unhappy or make you miss out on other fun things in life. Always report bullying. Report it to the site, your parents or carers or report it to the police. Report bullying so online gaming is safe for everyone. This entry was posted in Gaming, Online, Reporting and tagged Gaming, online safety on January 15, 2016 by Eastside Community Heritage Project. Twitter is a social networking site on the Internet. Twitter lets people to make and share comments, ideas or opinions with each other. 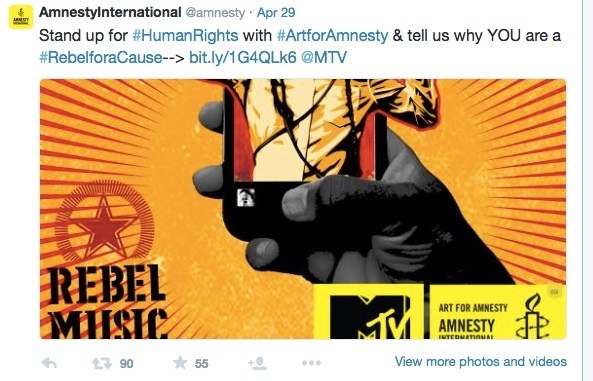 Twitter allows communities across the world to come up with good ideas or stand up for their rights. Anyone over 13 can sign up or register to use Twitter. People registered to Twitter may write a message about what they think or feel and post the message online. Anyone with an Internet connection can read the messages. Twitter works a bit like birds tweeting or chirping to each other across trees in huge forest. Twitter has 500 million tweets a day! Twitter is a good way to spread news and make people think and learn. Here are some examples. 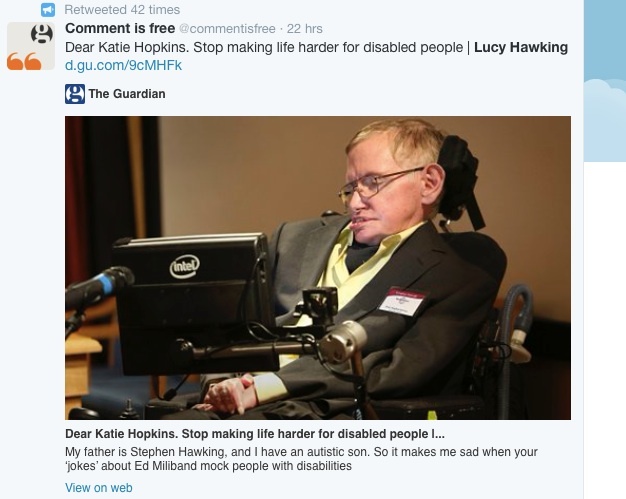 A woman called Lucy Hawking wrote a letter about disabilist language which was published in the Guardian newspaper. The letter explained how disablist language can hurt people. Many people read the letter because they heard about it on Twitter. We use Twitter to make people aware of disability bullying and hate crime. Lots of different people use Twitter. Twitter is full of people making interesting and sometimes funny or sad comments. But some people use Twitter to make hateful messages. Hateful message are sent to people about their sexuality, their religion or faith or their disability. Recently, a famous comedian called Sue Perkins left Twitter because she was receiving death threats from people. A famous Chef called Jack Monroe also left Twitter because of homophobic abuse. People who make hateful comments are called Trolls. Trolls bully other people using Twitter. Trolls create fear. Trolls stir up hatred. Hate and ignorance is not only directed at famous people. Hateful comments may be directed to anyone. Some people make hateful comments using hash tags. For example, they may use disabilist hashtags like #spaz or #retard. These hash tags are hurtful. These hash tags are hateful. Twitter is a company that invented a very clever technology to help people share who they are with the world. The company has a responsibility to provide a safe space for all people. This is especially important because the company Twitter is encouraging people to share. People share pictures of themselves, their ideas, their thoughts and their identities. Companies that provides a space for young people must make sure that everyone is safe from hateful comments and behaviour. The owners of Twitter are very rich because over 300 million people use Twitter. Some of profit from Twitter should be spend on safety. Social networking sites like Twitter and Facebook have a responsibility to stop hate. Twitter has some good ways to report hate. You can mute or block or report hateful messages. But is Twitter doing enough to keep everyone safe? Can Twitter do more? Can everyone do more to stop hate? This entry was posted in Language, Online and tagged Language on May 1, 2015 by Eastside Community Heritage Project.